Utilize our social know-how of what and when to post to get you new customers. Showcase your business. Update your info. Add photos. All without calling your hard-to-reach webmaster. Your page is mobile-friendly and Google search optimized to help you reach new customers. 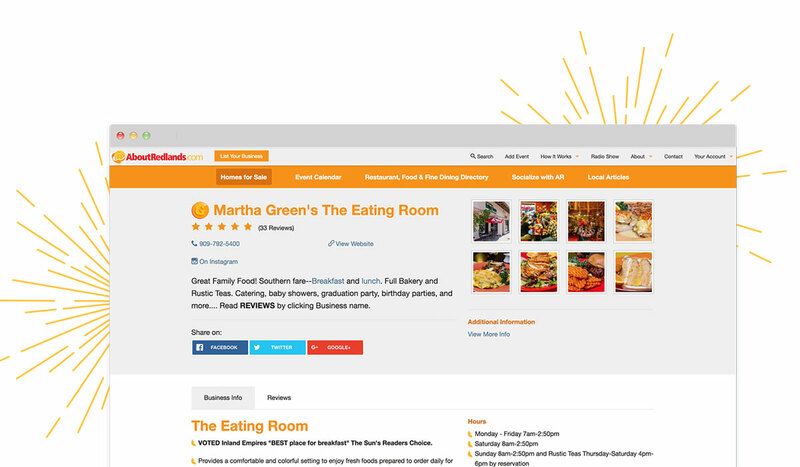 View Martha Green's page as an example. We're Redlands' trusted concierge, connecting real customer needs to quality local businesses like yours. As a member, we can recommend you with authority. Paying to boost posts on your page gets you some awareness. When AboutRedlands.com shares your business on our social media profiles, you get results and referrals - for much less. Reach 7 times more people on AboutRedlands.com than the Daily Facts. List your event on the only City of Redlands endorsed calendar. Increases awareness of your business’ unique products and services. Showcase exclusive offers, share newsworthy tidbits, or promote a special menu. We curate your About Redlands profile page with genuine reviews of your business - making it easy to share your success. Leverage our experience to help you communicate what matters most. Guest blog to our 67,000+ followers and showcase your business' expertise and success stories. We'll take care of giving you an audience and get your articles seen. Video is powerful, but difficult to create. Let our local professionals Livestream your business and share to Redlands what makes your business standout. 2 Annual sets of Tri-fold brochures or rack cards featured in our Visitor Center. I want you to know that I very much appreciate the hard work you do for all of Redlands Businesses. You are a huge help for us.